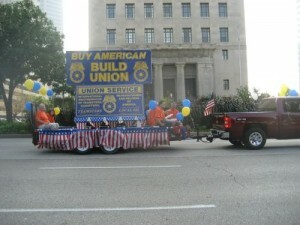 I imagine the Labor Day parade today will be a celebration of the recent defeat of “right to work” in Missouri. Voters in Missouri have overwhelmingly rejected a right-to-work law passed by the state’s Republican-controlled Legislature that would have banned compulsory union fees — a resounding victory for organized labor that spent millions of dollars to defeat the measure. I thought our deep-red state would support Prop A and approve right-to-work. This seems to show a good campaign can sway enough rural voters. The impact of unions on total nonunion wages is almost as large as the impact on total union wages. The most sweeping advantage for unionized workers is in fringe benefits. Unionized workers are more likely than their nonunionized counterparts to receive paid leave, are approximately 18% to 28% more likely to have employer-provided health insurance, and are 23% to 54% more likely to be in employer-provided pension plans. 7 a.m. – march from McDonalds to a public rally. 8 a.m.- rally at 18th and Olive to urge more St. Louis’ businesses to maintain the $10 an hour wage that been already agreed to by over 100 firms. The parade begins at 9:15am, 15th & Olive.